Plastic pallet Palette weighs moins de 15 kgskg (empty). 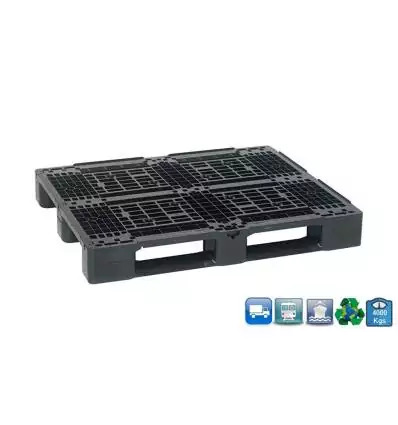 Plastic pallets are not concerned by IPPC regulation inc. ISPM15, meaning this item can be exported all over the world without any extra treatment or extra administrative foreign office process. For your information, ISPM15 (Heat treatment) regulation must be respected and proven for all wooden packaging (including pallets) exported outside EU. Plastic pallets dimension, due to production process, can be under a normal dimensional tolerances of +/- 0.5%. However tolerances affect mainly the weight. Outer dimension are rarely impacted. - Easy to clean thanks to its structure. The minimum quantity for ordering this item is 16 pallets. A full truck is composed of 26 stacks of 16 pallets. For large quantity more than 16 stacks, we manufacture specifically your goods. We ship all over Europe, in the UK and Ireland as well. For islands and for being closer to our costumer, we prefer to offer you a free quote before your order. In that way, we’ll provide you the best proposal. 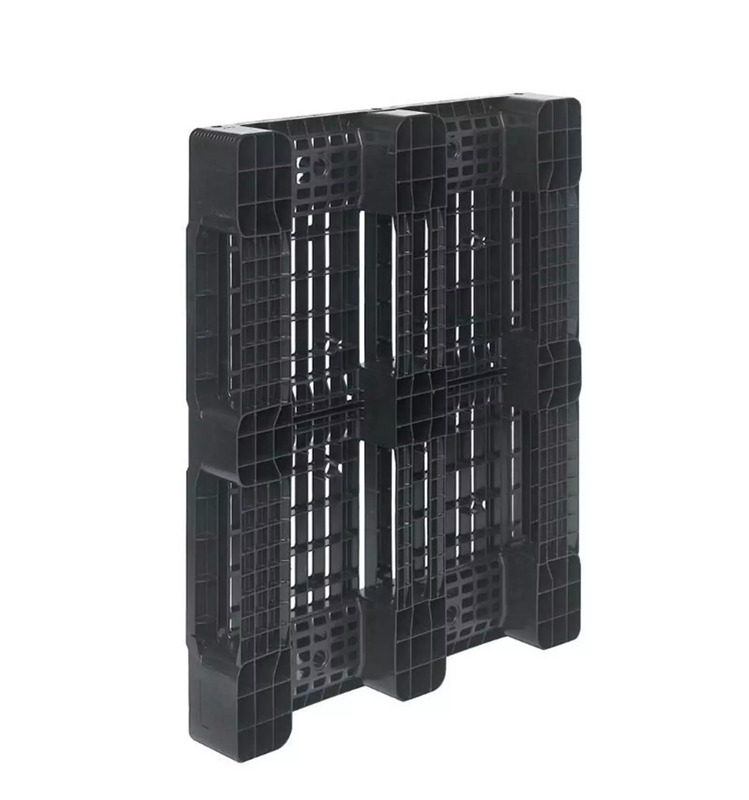 This plastic pallet can be handled with a standard forklift and/or automatic and/or manual stacker on its 4 entries. Plastic pallet can be bring by hand, however for safety reasons take care of wearing adapted gloves. We can personalized your plastic pallet by adding your logo, or other things like traceability number or asset identification. Customization is available on one or two side of the pallets. We can offer you 2 ways of personalization. The cheapest, by adding a plastic label long resistance printed on 1 or 2 side. The best, by incorporating the label during the production process. 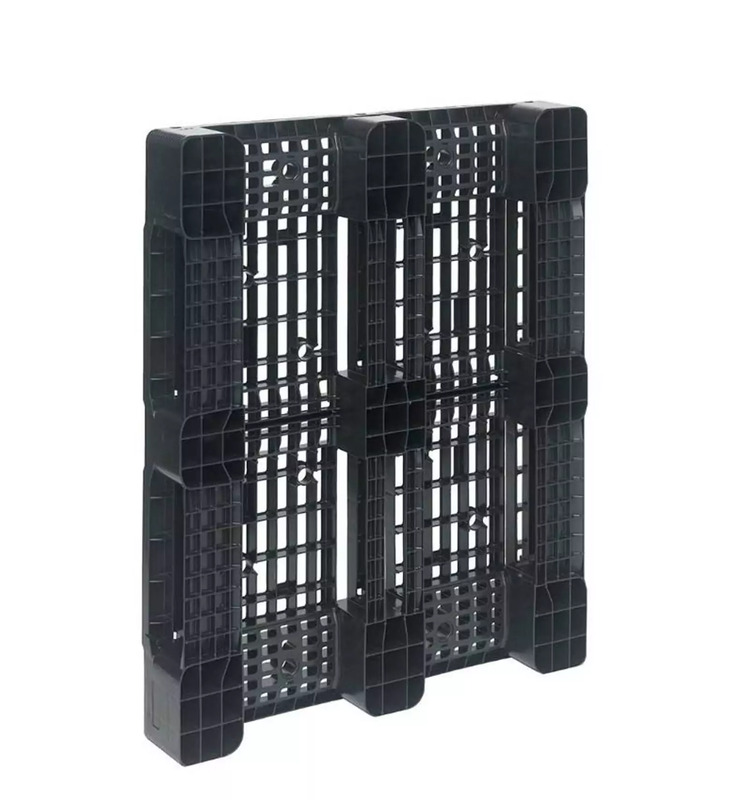 Your identification will be molded into your plastic pallet therefore indestructible. Depending of the quantity requested, we offer you to choose the color of your future plastic pallet. Do not hesitate to contact us for a free quote ! As an option, We can provide you Antistatic – ESD material for your plastic pallets. The Antistatic surface resistance will between 10-4 and 10-8 Ohms. If you need Antistatic material, please send us back your request. Plastic Pallets 100X120 3 runner Perforated Top is produced with high level of quality. Raw material (HDPE virgin or recycled following the product), in our case HDPE recycled, are checked before using in the mold. Sampling tests are done on each production batch. In case a product does not reach testing phase, it is rejected and destroyed. 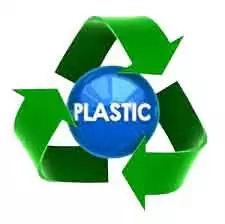 For sustainability reasons, plastic granulates are reused and reinjected in a new production. At end of life, they must be recycled in an appropriate network. Plastic granulates will be reused to produce new goods like bottle caps. Opting for an ecological strategy, plastic pallets presented here are produced with HDPE recycled material. If you do not know how and where to recycle damaged pallets, we're committed to take them back for you and give plastic to a second life. Thanks to a large range of solutions, we can suggest you similar products in the same category size “1000 X 1200”. - PressWood Pallets, the best combination between price and resistance.